The name refers to one of the clans of the historic Illini confederacy, who met early French explorers to the region. Early European settlers named the nearby (and long-abandoned) Cahokia Mounds in present-day Madison County after the Illini clan. But the UNESCO World Heritage Site and State Historic Park was developed by the prehistoric Mississippian culture, active here from 900AD to 1500AD. They created an extensive urban complex, the largest of the farflung Mississippian culture territory through the Mississippi and Ohio river valleys. French Canadian colonists founded Cahokia village in 1696 as a Catholic mission. The historic Church of the Holy Family is the oldest continually active Catholic parish in the United States, as well as the oldest church west of the Allegheny Mountains. Other significant colonial and Federal-period buildings listed on the National Register of Historic Places include the Cahokia Courthouse (c 1740, in the French Colonial style); and the Jarrot Mansion (c 1810). Location of Cahokia in St. Clair County, Illinois. Archeologists ascribe the earthwork mounds Cahokia complex to the Mississippian culture, an earlier indigenous people who are not believed to have been ancestral to the Illini. The city site reached its peak in the 13th century and was abandoned centuries before European contact. The Cahokia Native Americans of the Illini did not coalesce as a tribe and live in the Illinois area until nearly the time of French contact 300 years ago. Father Pinet founded a mission in late 1696 to convert the Cahokian and Tamaroa Native Americans to Christianity. Father Pinet and the Seminary of Foreign Missions of Quebec built a log church and dedicated it to the Holy Family. During the next 100 years, Cahokia became one of the largest French colonial towns in the Illinois Country. It was centrally located for trading Indian goods and furs, and grew to about 3,000 inhabitants. Its thriving business district reflected a frontier society numerically dominated by needy males, as it had 24 brothels. The nearby town of Kaskaskia on the Mississippi River (founded 1703) became the region's leading shipping port, and Fort de Chartres (founded 1718) was developed by the French as a military and governmental command center. The 50-mile (80 km) area of land between the two villages was cultivated by farming settlers, known as habitants, whose main crop was wheat. As settlement expanded, the relationship between the settlers and the Indians continued to be peaceful. Settlers were mostly Canadien migrants whose families had been in North America for a while. Cahokia declined after the French lost the French and Indian War in North America to the British in 1763, as part of the broader Seven Years' War in Europe. Only Fort Kaskaskia (built 1733) was destroyed in the conflict, and Cahokia remained regionally important for another four decades. In the treaty ending the war, France ceded large parts of what it called the Illinois Country east of the Mississippi River to the British, including the area of Canada. Many French-speaking residents of Cahokia and elsewhere in what had been Upper Louisiana moved west of the river to territory still controlled by the French rather than live under British rule. Many moved to Lower Louisiana, where they founded new Canadien villages on the west side of the Mississippi River, such as Ste. Genevieve, Missouri and St. Louis. In 1778, during the American Revolutionary War, Virginian George Rogers Clark captured Kaskaskia and set up a court in Cahokia, making Cahokia an independent city state even though it was part of the British Province of Quebec. Cahokia (and Kaskaskia and the rest of Illinois County) officially became part of the United States by the Treaty of Paris (1783), by which the United States took over former British territory west of the Appalachian Mountains. The US soon designated this area as the Northwest Territory(and, after Ohio and Indiana became states, the Illinois Territory). Meanwhile, 105 Cahokia "heads of household" pledged loyalty to the Continental Congress of the United States. After Congress passed the Northwest Ordinance in 1787 and established a governmental system for the territory, the Cahokia Courthouse was adapted for use as a United States territorial courthouse. Cahokia continued as a major political center for the next 24 years. Flood-prone Kaskaskia became the governmental seat of the Illinois Territory (1809-1819), until the territorial seat was moved to Vandalia, Illinois, and in 1809 became the county seat of Randolph County. Cahokia became the seat of St. Clair County, named by and after Arthur St. Clair, the first territorial governor. When St. Clair County was enlarged in 1801 and 1809, Governor William Henry Harrison (and later territorial secretary and acting governor Nathaniel Pope) named the Cahokia Courthouse as the legal and governmental center of a sizeable area extending to the Canada–U.S. border. By 1814, other counties and territories had been organized, and St. Clair County became its current size. 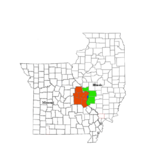 The county seat was moved to the more centrally located Belleville, Illinois (incorporated 1819 and as a city in 1850) when a local developer offered to donate land for a new county courthouse and seat. In the late 1950s, Cahokia annexed some population and territory, increasing its population by more than 15,000 in 1960. Cahokia is located at 38°33′43″N 90°10′22″W﻿ / ﻿38.561901°N 90.172878°W. In the village, the population was spread out with 33.4% under the age of 18, 8.7% from 18 to 24, 29.4% from 25 to 44, 16.9% from 45 to 64, and 11.6% who were 65 years of age or older. The median age was 31 years. For every 100 females, there were 88.7 males. For every 100 females age 18 and over, there were 82.5 males. Cahokia Unit School District 187 operates public schools. Reed, Denita. Cahokia (Images of America). Arcadia Publishing, 1998. ISBN 0738589977, 9780738589978.